But the radical trade union the Industrial Workers of the World (IWW) isn’t buying it. While they have publicly stated that paying above the Living Wage (which in London is meant to be £9.15) is to be applauded, the IWW says it’s moot in circumstances in which employees are not guaranteed the necessary hours to provide for themselves. 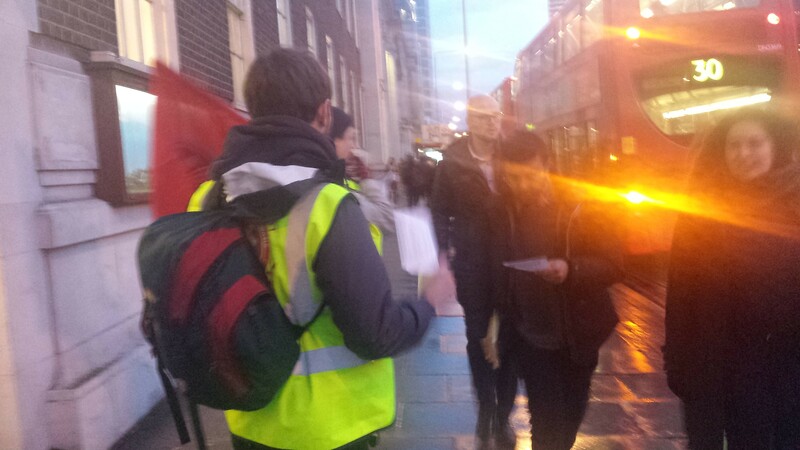 IWW members leafleting on Euston Road outside Friends House, just around the corner from UCL. Whether the sackings were really politically motivated or not, many activists and trade unionists have seen this as an affront to the livelihoods of three people. In fact, after speaking to several demonstrators on Friday, I was came to realise this protest is just one chapter of a much larger saga. Martin (left) holding an IWW flag, alongside an IWGB member. Perhaps the most impressive thing about the protest was the presence of the International Workers Union of Great Britain (IWGB), a “worker-run union organising the unorganised, the abandoned and the betrayed”. 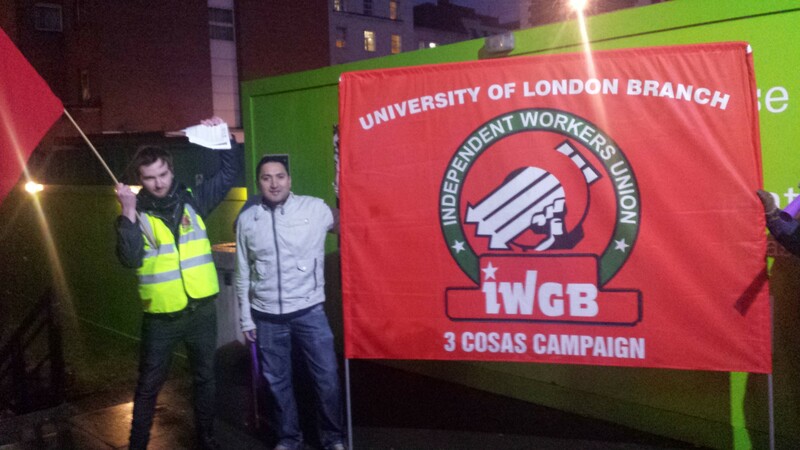 The branch of the IWGB specific to University of London recently exploded in size due to their 3 Cosas Campaign demanding full employee rights (ie. 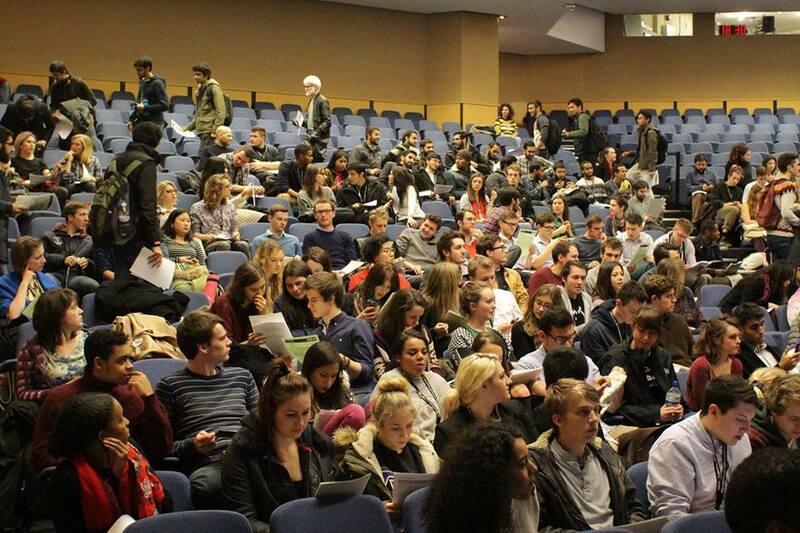 sick pay, pensions and holidays) for the university’s predominantly migrant cleaning staff. I spoke to Jason, the President of IWGB, and he explained: “The reason why we’re here is because although our focuses are slightly different, we’re still campaigning on the same issue, which is the precarious situation workers face in this country. 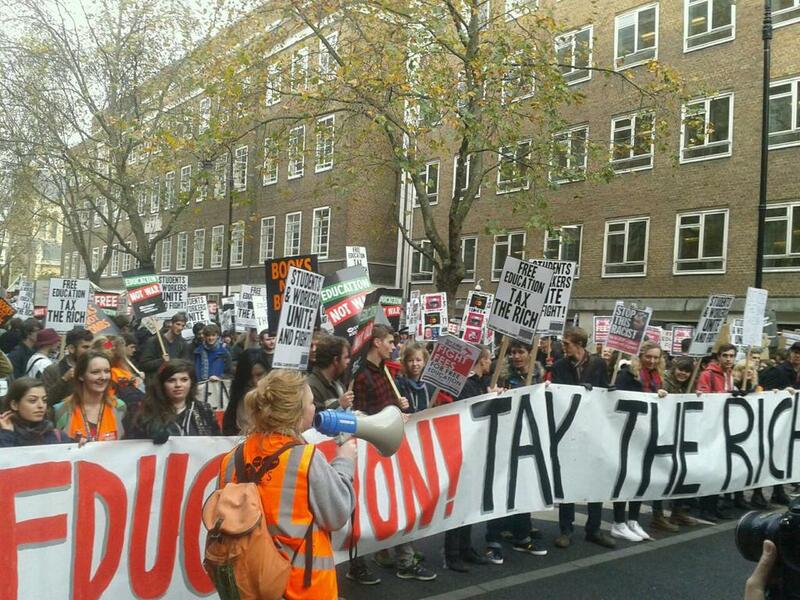 Zero hours contracts are just one example of that”. 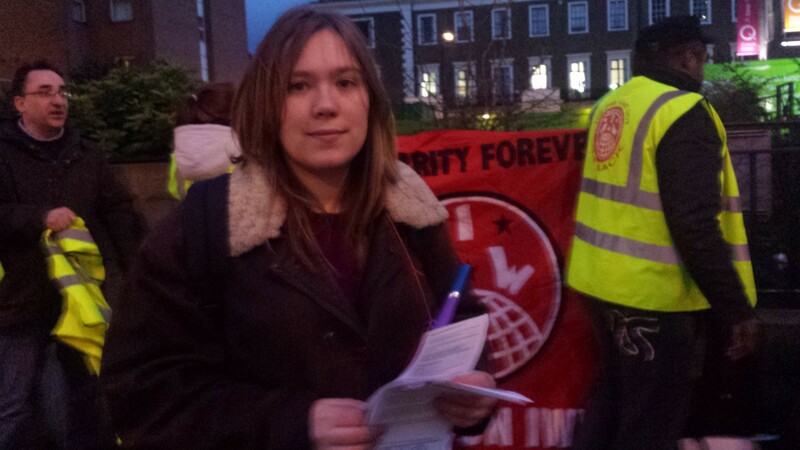 Hannah Webb, former UCLU Sabbatical Officer taking a stand against zero-hours contracts and trade union victimisation. Zero hours contracts and other issues related to low wage work are so problematic in the UK, in part, because we have so little information on their impacts on households. 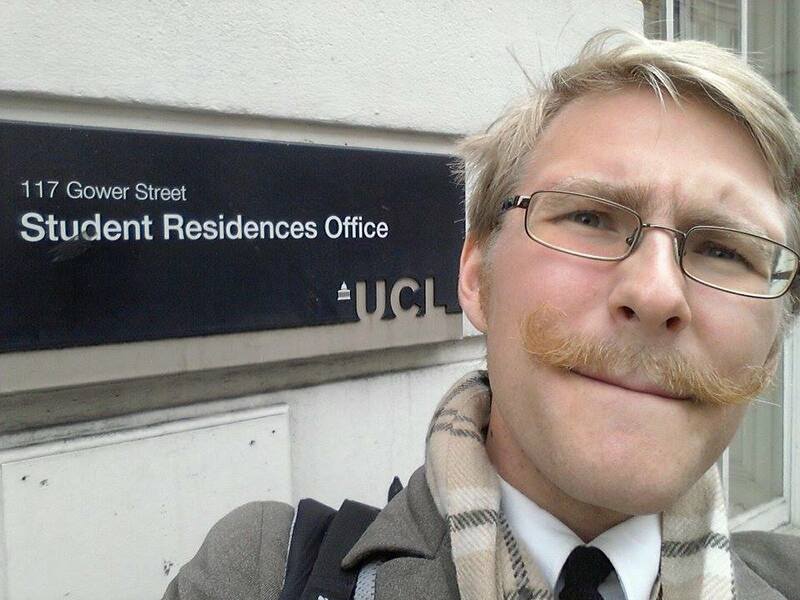 Despite UCL’s promise that, within six months of graduation, approximately 90% of undergraduates enter the workforce or pursue additional studies, there’s very little data on what sort of hours people work. We know that unemployment technically fell to 1.91 million in 2015, but someone with a zero hours contract is lumped in to the same statistics as those that “enjoy” full-time hours. 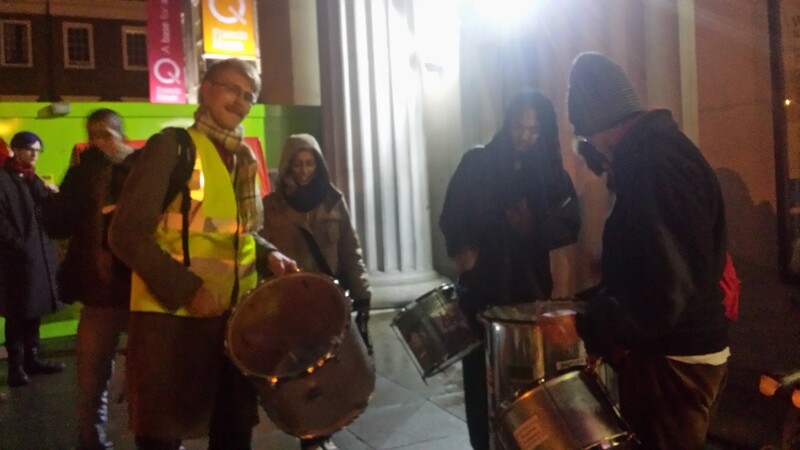 David Dahlborn fulfilling his dream of playing with the SOAS samba band on a picket line. In the end, the question prescient at this specific protest – whether or not the fired employees of the Friends’ Meeting House will keep their jobs – remains unanswered. Martin seems confident they will.